The contents of this sampler vary. Each will include at least six varieties of our handcrafted cheeses, that’s at least three pounds of cheese (unaged and aged cow's milk cheeses). Assortment may vary from that shown, depending on availability. ♦ This item includes a Maine made wooden slide top box. We had these custom made for us by Nezinscot Guild in Turner, Maine. 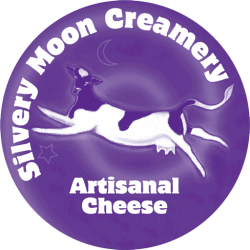 ♦ We include information about Silvery Moon Creamery as well as Smiling Hill Farm and a greeting card. Gift? If you wish you can specify a customized greeting in the input box on the shopping cart page. • We are happy to ship our cheeses year round throughout the contiguous U.S. You can also contact us for a more customized order. • All cheese orders other than Cheese Platters include a Maine made wooden slide top box. We had these custom made for us by Nezinscot Guild in Turner, Maine. 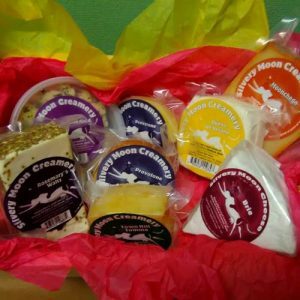 • We include information about Silvery Moon Creamery as well as Smiling Hill Farm and a greeting card. If you wish you can specify a customized greeting. • This is all packaged in a Styrofoam shipping box with frozen gel packs and is clearly marked as perishable. • Please allow two weeks from the time we receive your order to the time you want the recipient to receive the order. The cheese will ordinarily ship within a week of your order, although our most popular cheeses sometimes have waiting lists. Should that happen, we will contact you and let you know when your cheese will ship. We only ship Monday through Wednesday, to ensure the package does not linger over the weekend. • If you are sending this cheese as a gift, please let the recipient know that a perishable product is on its way to ensure that they put the cheese in the refrigerator upon arrival. • Go to Order Cheese for an overview of all our online product offerings.